Wild rocky and covered with pine trees, the north coast of Menorca is a complete contrast to the limestone ravines of the south. 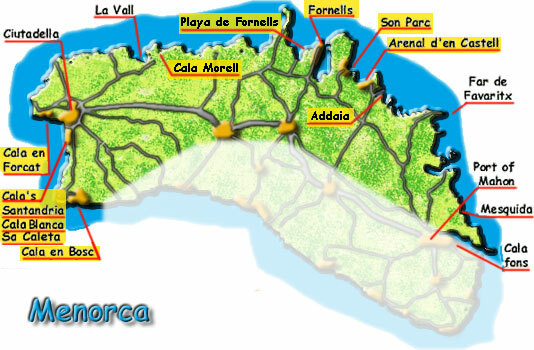 Only a small area from Fornells to Addaia has been developed for the holiday industry, the rest of it remains as beautiful as nature intended. 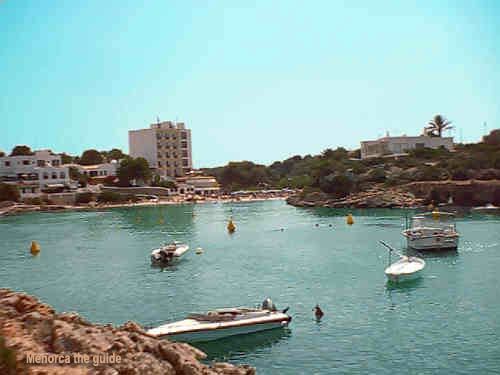 The west side of Menorca to the south of Ciutadella has a string of small peaceful holiday resorts nestling around picturesque cala's. Los Delfines on the other hand is a large brash busy resort with everything the visitor could want, and probably more besides. 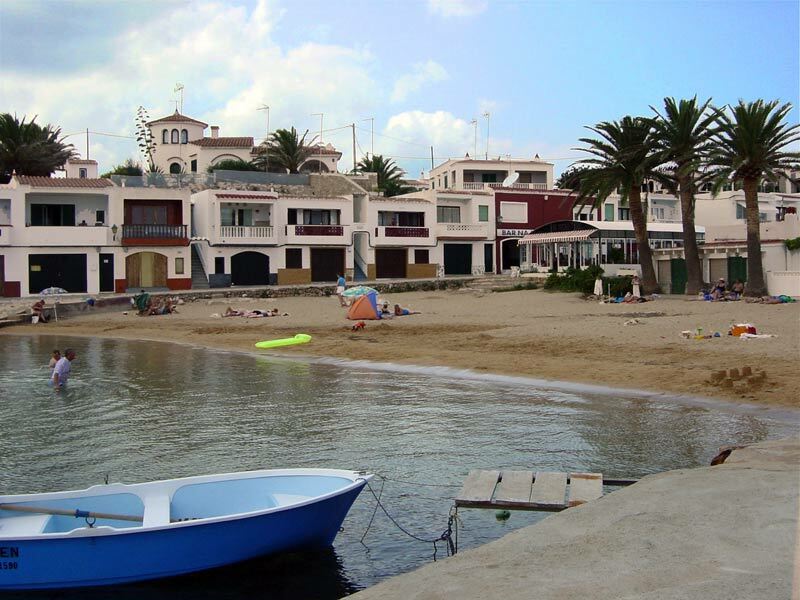 Fornells On the north coast, a small and very smart looking fishing village situated at the head of an enormous bay. Almost landlocked, the bay keeps fairly calm even when the Tramuntana blows This is what makes the area ideal for windsurfing and sailing, both of which are on offer, with tuition from one of the many schools. 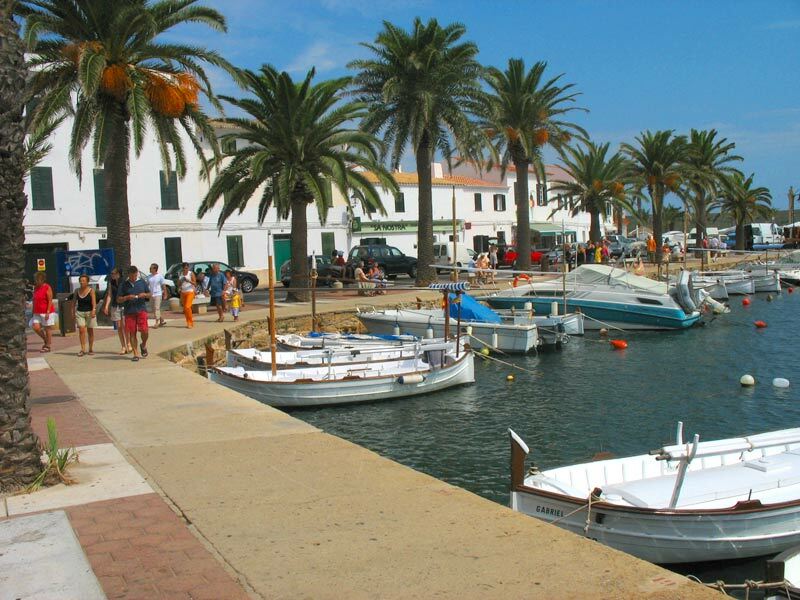 Fornells has also In recent time become the smart place to eat, there are plenty of bars and restaurants to choose from. This small village remains undeveloped, and as there is no beach here it should remain this way. Playa de Fornells [Tirant Playa] On the north coast near to the village of Fornells, is the very impressive development of Playa de Fornells. What impressed me most about this resort was the way some thought had been put into the design and layout. Most of the accommodation is built along a hillside around the bay of Cala Tirant, giving them a fabulous view. The second was the way it is looked after, all the property looks well maintained and very clean the gardens were immaculately manicured. With a reception / information office, shops / supermarkets, and a good choice of bar / restaurents. Over all a very nicely presented holiday resort. Click here for a little more. Arenal d`en Castell Near Son parc & Na Macaret, Arenal d'en Castell Is built around a large very picturesque and beautiful crescent shaped beach, of very soft golden sand. This is a very Popular resort with two large 3 star hotels, a large number of privately owned villas and a few apartment complexes. The beach is ideal for bathing and very safe for young children. All manner of water sports are on offer on the beach along with sun lounges, parasols and pedalos. The resort has a large, selection of good bars and restaurants and all the shops you will need for day to day living. Port Addaia A small development of villas and apartments on the edge of a narrow and beautiful sheltered Inlet. This makes it Ideal for yachts, there is a small port where you can go diving or fishing There are spectacular views across to Macaret. A small shopping center with bars and restaurants completes the resort, don't forget to book a car when staying here to get the most out of your holiday. Addaia is the ideal spot to recharge your batteries and completely relax. Na Macaret a pleasant 30 min's walk from Arenal D'en Castell. Na Macaret a small fishing village, with a good if small beach that offers safe bathing for children. With only a few restaurants that pride themselves on providing good food with an emphasis on fresh fish, Na Macaret offers an excellent opportunity to relax In this quiet and tranquil Menorcan village. Staying in this resort? then you will need a car. 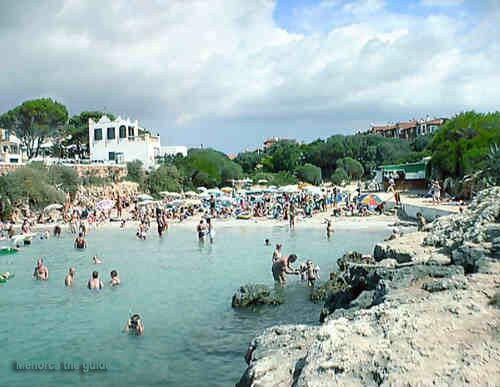 Cala n Bosc, Son Xoriguer can be found in the south west corner of Menorca. A large and some what busy resort, centre's on the attractive marina which comes to life in the evening, with market stalls selling all manner of trinkets, amusement arcades and play areas for the younger end and bustling music bars. Cala'n Bosc has a large variety of restaurants offering everything from the cheep and cheerful burger to a full five course gastronomic delight. The resort boasts a large selection of fine hotels large and small, apartment complex's and apart hotels. Cala n Bosc is geared towards the family especially those with older children, the resort is growing fast but the development is all of a high quality. Son Parc is a small and fairly quiet resort between Fornells and Arenal d'en Castell, and has the Islands only golf course. The resort is surrounded by pine trees, and overlooking a beautiful beach of fine sand, backed by sand dunes. The warm and very shallow sea ideal for young children to paddle and play in, there is plenty to offer the visitor. A small commercial area is home to a few bars, restaurants and shops. Golf info can be found here. Es Grau Just north of Mao. This is a small very picturesque fishing village on the shore of a large round bay with a gently shelving beach with shallow water. The village of Es Grau has a local well stocked Spar shop, three bars, two of which serve Tapas, and one restaurant over looking the bay. A ferry boat can be booked locally most days in the summer (weather permitting) for a trip around the bays or a day out on the Isla d'en Collom. 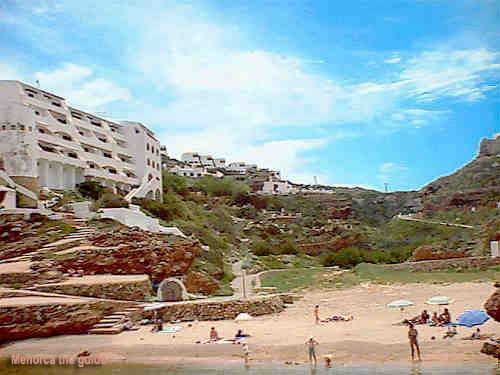 There are there are smaller coves and beaches further around the bay that are well worth a visit, some of these smaller beaches are popular with naturists. Behind the beach can be found S'Albufera The largest natural salt water feeding and resting area for migrating bird in the Balearics. The whole area has been declared a nature reserve. Cala Morell North of Ciutadella. A very small, quiet and picturesque hamlet built around a very steep sided george with many caves. Mainly private villas but has two or three apartment blocks. A small sandy beach and just a couple of bar/restaurants. 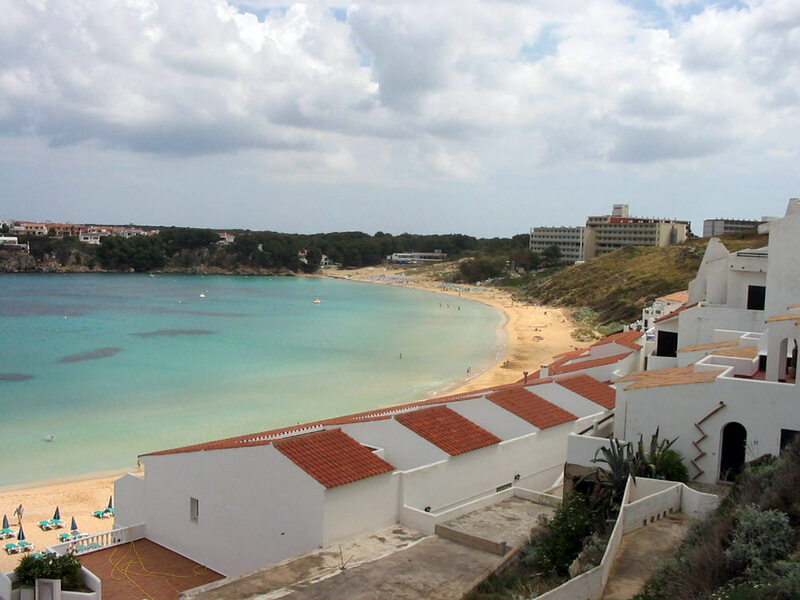 Cala Morell is ideal for a "Off the beaten track" holiday. Note if your staying here a car is a must. Calan Forcat West of Ciutadella, Unlike many of the resorts on Menorca, Cala'n Forcat is quite busy and very touristy. There is a large choice of accomodation restaurants, bars, shops & supermarkets. With three [Small] beaches and a water park situated on the main road there is plenty for everyone. This is a very busy resort geared to the holiday maker who wants everything on their door step. Cala Blanes. To the eastern end of Cala Forcat is the quieter area of Cala Blanes, it has it's own beach at the end of a long calm inlet with sun beds etc. It's ideal for those looking for qualty accomodation in a quiet base, but only a short walk from the much livelier centre of Cala n Forcat. Cala Blanca/Santandria Situated on south of Ciutadella, Cala Blanca and Santandria is a tranquil resort and is popular with Menorcan's who head that way on a weekend. 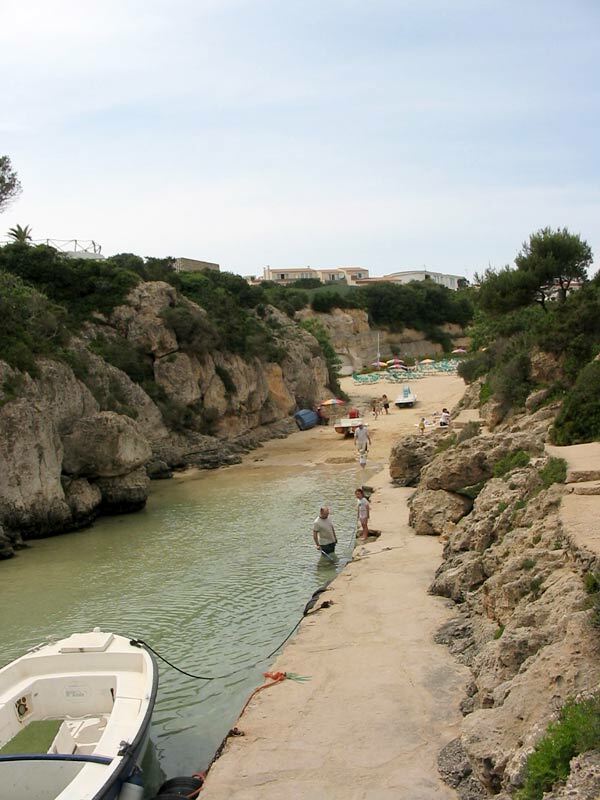 Set around a rocky cala, it has a sandy beachs with sun lounge's parasols and pedalos'. Sa Caleta is a peaceful cove next door. The resorts has a full array of water sports including scuba diving and is not far from Cala`n Bosc, where you can choose from a greater number of water based activities. Cala Blanca/Santandria have a wide choice of accomodation, plenty of restaurants, bars and shops to cater for your day to day needs, but for serious shopping, Ciutadella is the place to go. For more about the area click here. Sa Caleta The small sandy beach of Sa Caleta lies at the end of a very picturesque cala just to the south of Ciutadella, at the end of which is an old watch-tower, standing guard against would be invaders. The white sandy beach and clear waters make this lovely for swimming. On the beach you'll find sun lounges, parasols and pedalos. for hire. It's a very quiet resort, perfect to relax and unwind with a long ice cool drink watching the sun go down. The resort has few shops but with Ciutadella being next door you'll never go short of finding somewhere to spend your money. A short walk round the cliffs takes you to the small cove of Cala Santandria with Cala Blanca a little further south. 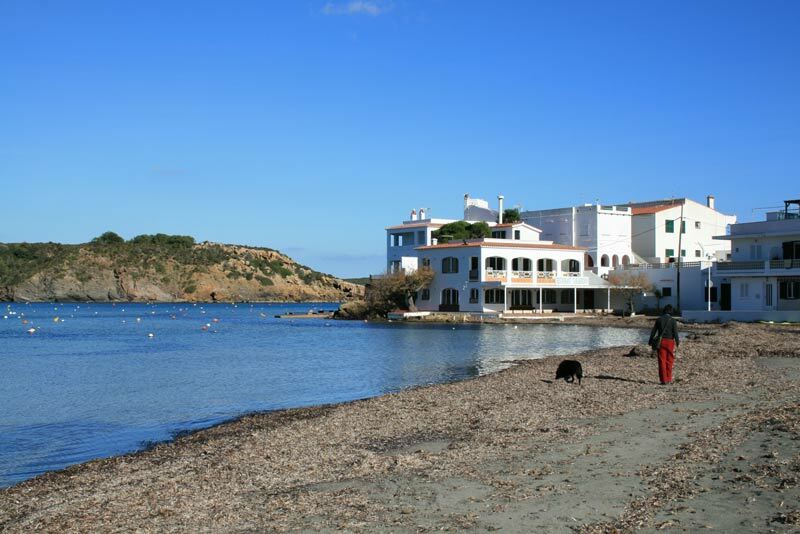 The best place for water sports is at Cala`n Bosc a few miles further south.